Finally got to make a ramen run with Joan after a long time. I was excited. 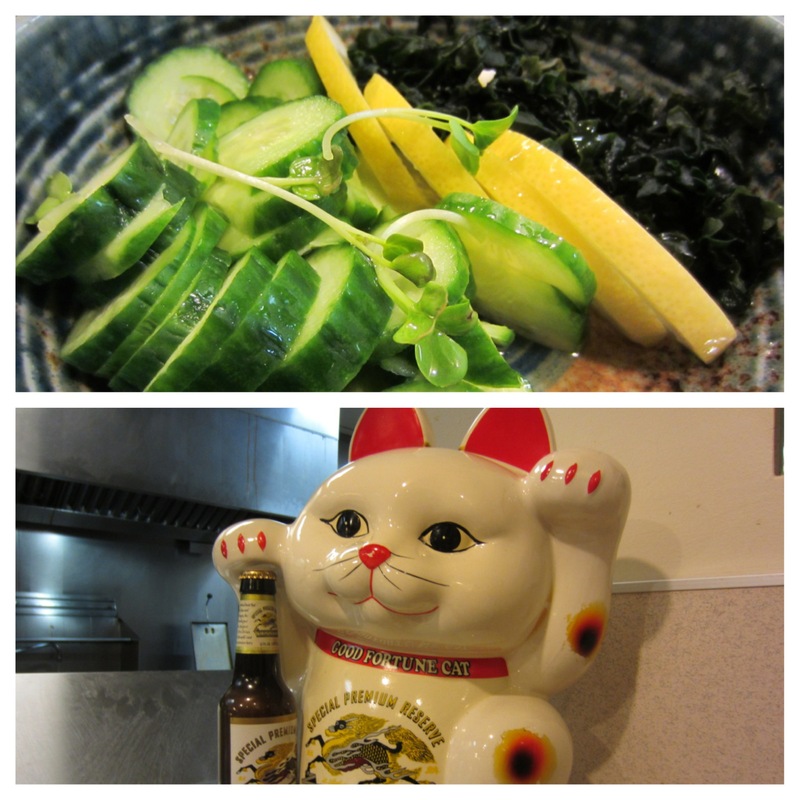 We decided to head out to Fountain Valley to a place called Ebisu. The shop is set in a plaza with a bunch of different shops. The place wasn’t too busy but the area was nice. Places to eat, shop, and a few hobby places. It was definitely an overdue ramen run because Tanya and I had not gone together since August. That and…. 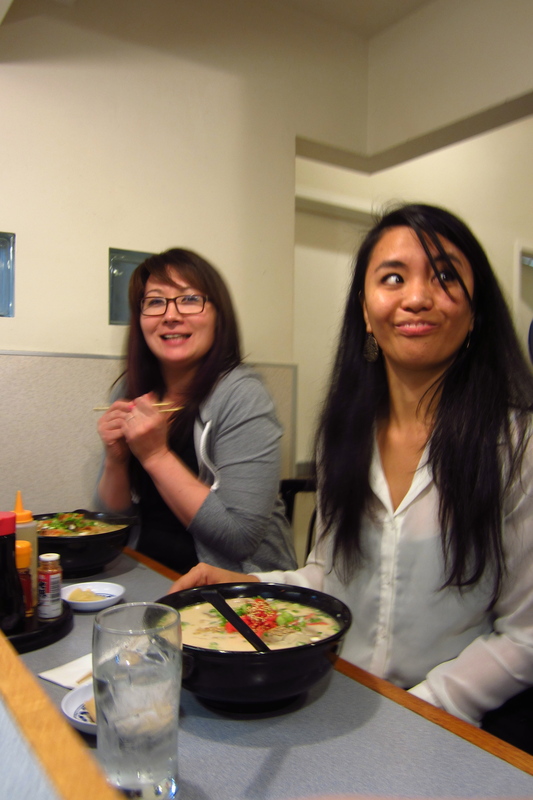 my friend Kim Long had been inviting me to Ebisu Ramen since the summer of 2011. AND my brother, Angelo, had not been on a ramen run in years. Definitely overdue. We arrived a little too early before Kim Long would get there, so we checked out what was around. Ebisu apparently took up most of the shopping complex. There used to be a huge Ebisu Marketplace that’s now closed, but they just opened up a small Ebisu Mart. We found some interesting stuff there! 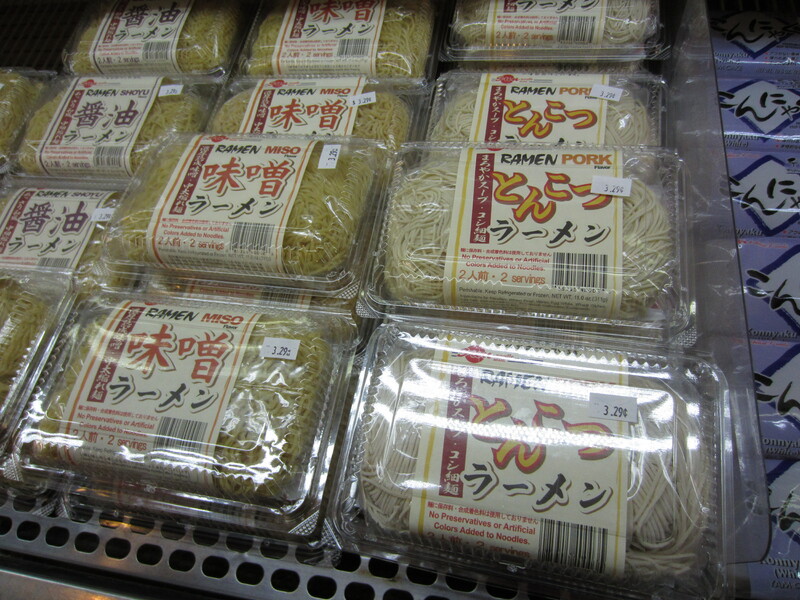 Sun Noodle ramen you can make at home!!! 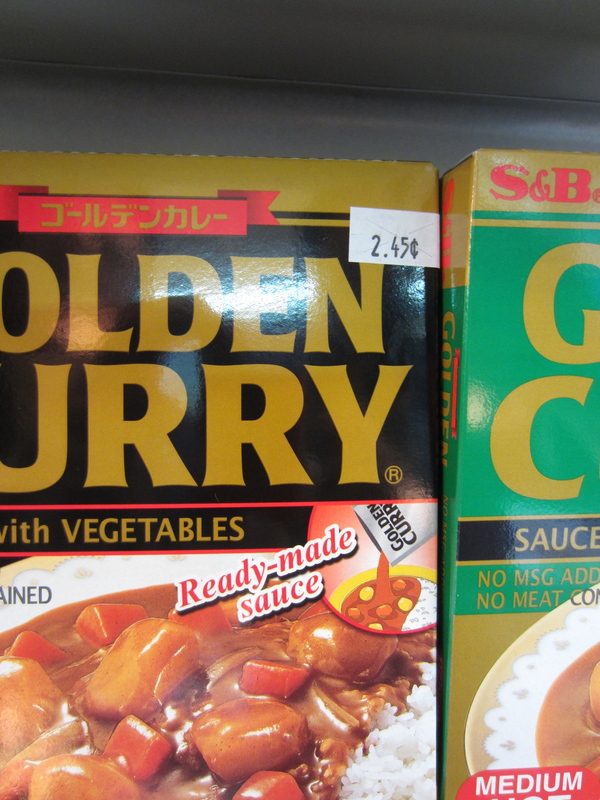 The cheapest box of curry I ever saw… how do you get 2.45 cents? Joan: Yeah… they were a little weird. But I forced myself to eat them just because I wanted to see if I’d like them eventually. I didn’t. They’re cute though, aren’t they? At a hobby store. 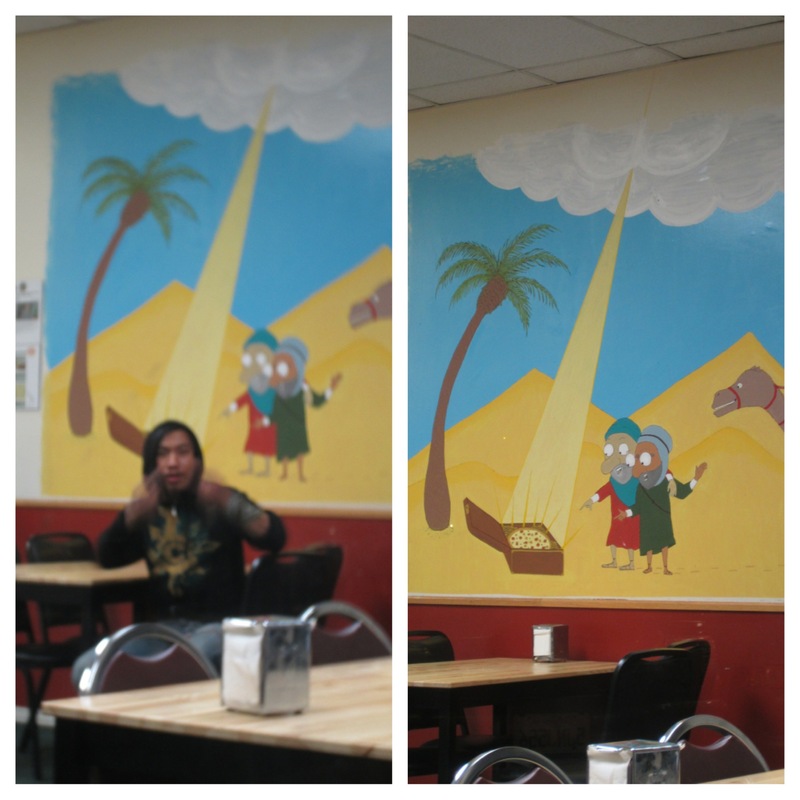 Can you guess what Angelo was really excited about?? 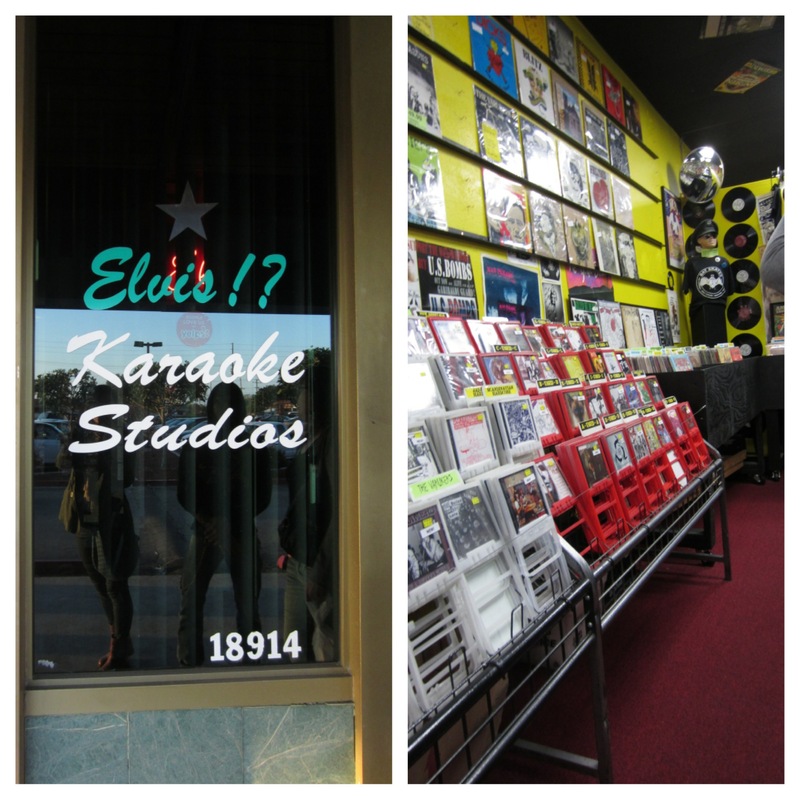 There was a karaoke joint and a cool record store! When Kim Long and his brother Kim Quang arrived, the restaurant wasn’t packed and we were seated at a table towards the front of the restaurant. Then a group of anime geeks (one was in cosplay) were seated behind us. They were… a bit smelly of B.O. so we requested to be seated at the bar. Mean? I know. But we had to move! View from bar seating, saw the non-Japanese chefs in action. Ordered some cucumber & spinach in vinegar for appetizers. Cute beer cat! Although the restaurant was called Ebisu Ramen, they had quite a large menu for just a ramen place. 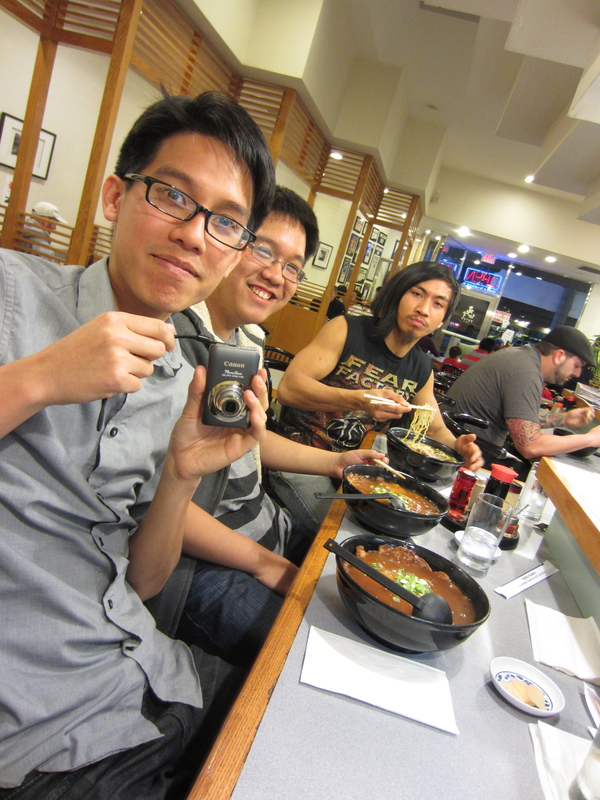 They had many things on their menu other than ramen, that they should have just been called a Japanese restaurant. But they had about 15 types of ramen. I ordered their Hakata Ramen, which actually was a mix of pork and chicken broth. Tanya ordered the Kimchee Ramen and Angelo ordered the Chashu Ramen with Shoyu broth. 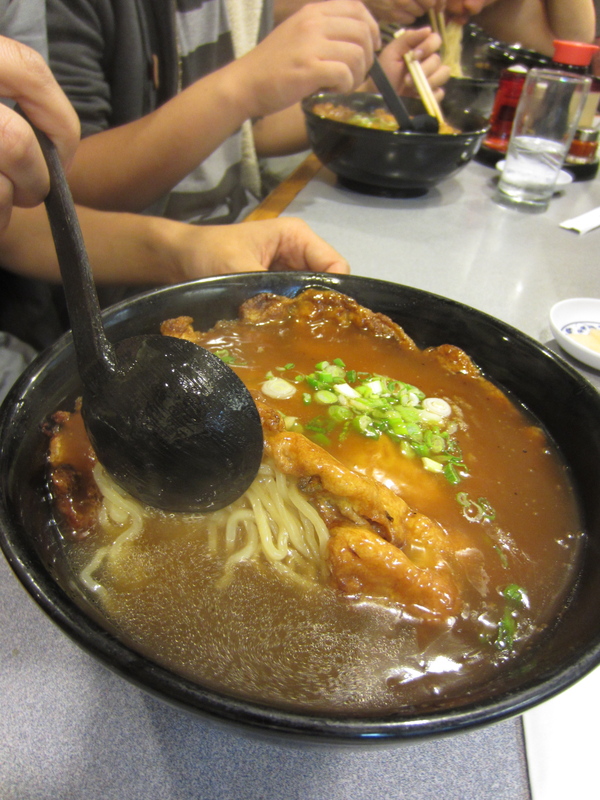 Kim Long and his brother both ordered the Tenshin Ramen with shoyu broth. Tenshin Ramen with a scrambled egg and gravy on top! What was up with that smile?!?! 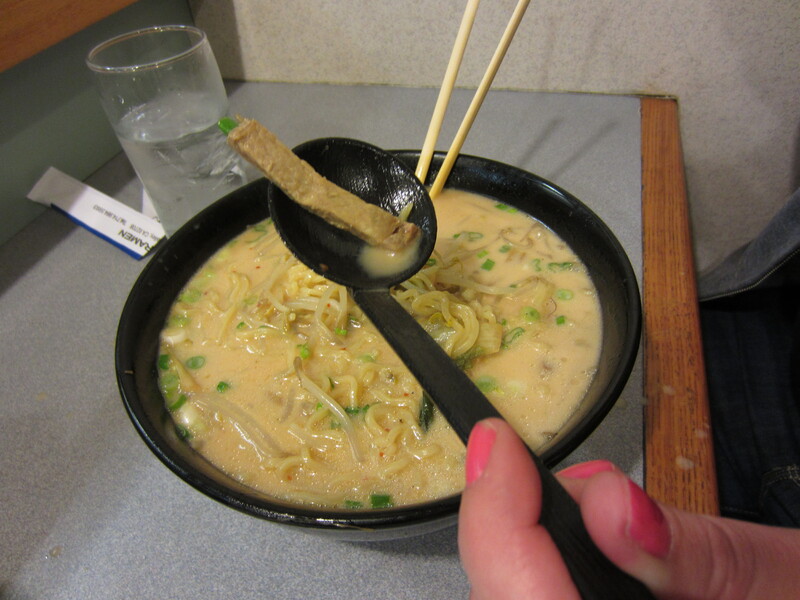 I made a GIF of me slurping ramen… but it looked too disgusting to post! 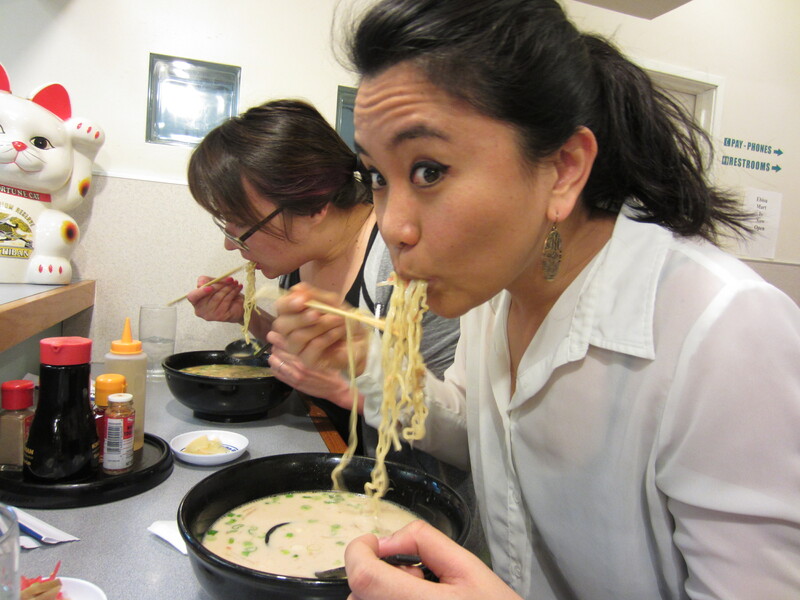 FYI, it’s not always easy to eat ramen with long hair. That’s why Tanya and I tied our hair up, including Angelo. Tanya: I had the Kim chee ramen. My ramen was good over all. Just a couple things did bother me. I enjoyed the flavor of the broth, but it was a bit too salty for my taste. I was almost turned off by my bowl but when I gathered everything, it came together so well. The noodles were curly, nice and chewy. The broth had really low oil and the meat sticks, chashu, had no fat in it at all. That is usually a really rare thing. The chashu had a good flavor but it was a bit tough. I liked the fact that they used kimchi that was at the best point. Not too fresh and not soggy. The kimchi changed the typical flavor of the ramen but in a good way. I would recommend to this place if you are in the area. 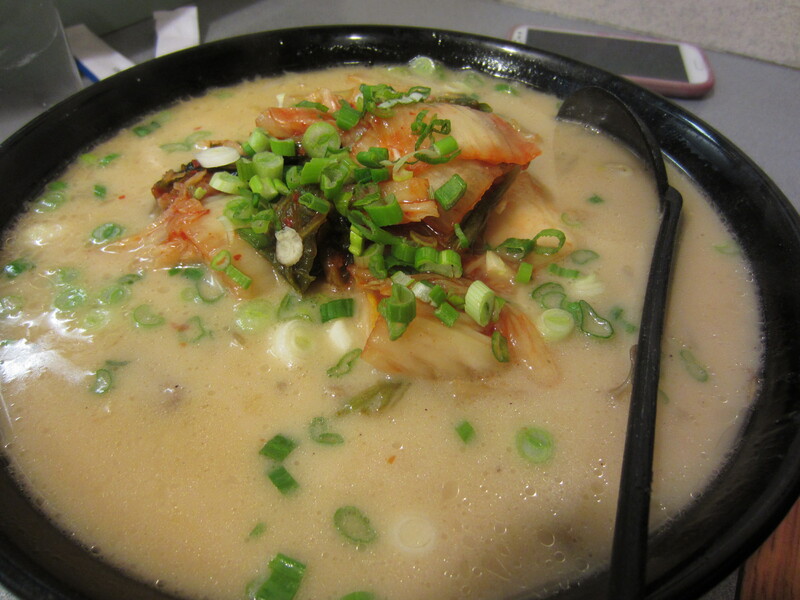 Joan: My Hakata Ramen was not too bad. It was better than the ramen I had at Kouraku last Saturday. The flavor of the broth was alright, it was a mix of pork and chicken which I wasn’t really a fan of. But I liked that it wasn’t too salty or oily. The broth’s consistency was on the thinner side though, which gave it a watered down taste of what it could have been. I really enjoyed the curly noodles that went with it, it was firm and chewy and had a nice flavor. The pork slices were mediocre, nothing special about the flavor and they were tender enough. I forgot to ask the ginger and bamboo removed but that didn’t matter to me. This ramen didn’t stand out unfortunately. It was worth a try though, and I can’t say it was the worst ramen I’ve ever had! Honestly, if I’m in the area, I don’t think I would come back here just to eat ramen. 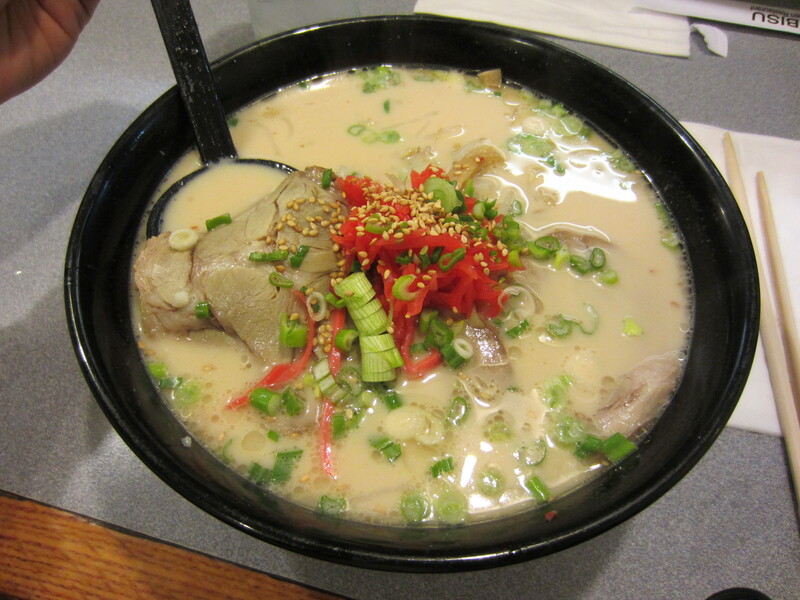 Shin Sen Gumi is just up one block, which is a really great place for ramen. But I think I would come back just to check out the Ebisu Mart, which we did after dinner! 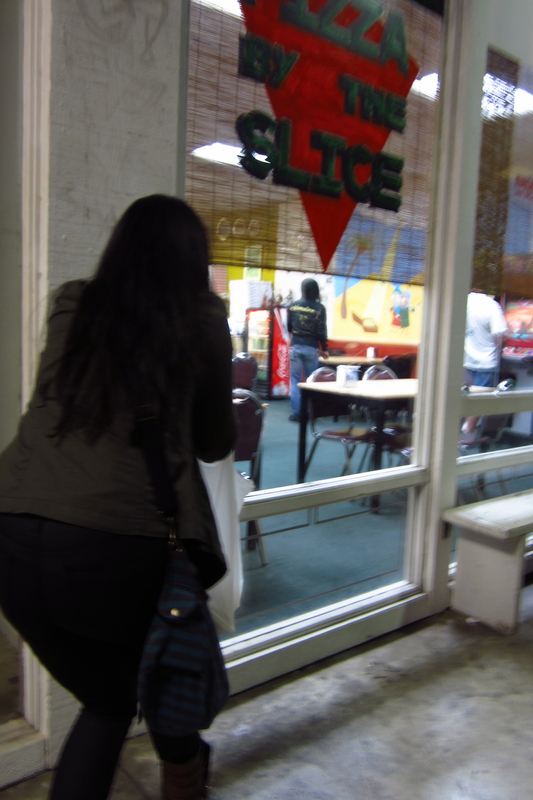 We went back because we wanted to buy the Sun Noodle ramen, along with some mochi ice cream, coffee drinks, etc., I couldn’t believe that my brother Angelo was still hungry so we stopped by the pizza place, a few shops down. We bought a bunch of Sun Noodle packets, which we will blog about later! 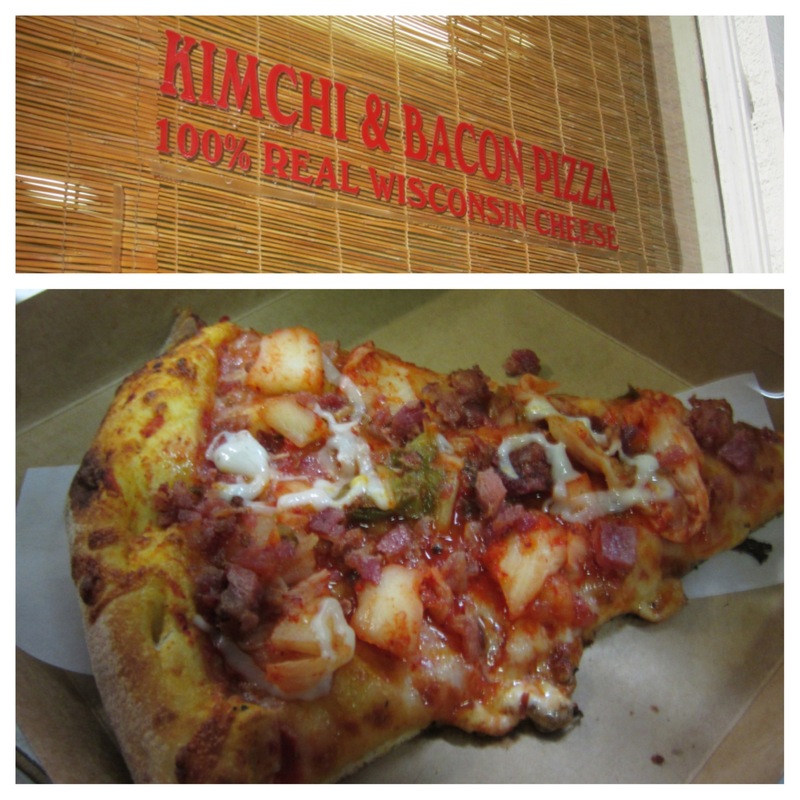 Angelo ordered the Kimchee Pizza…. 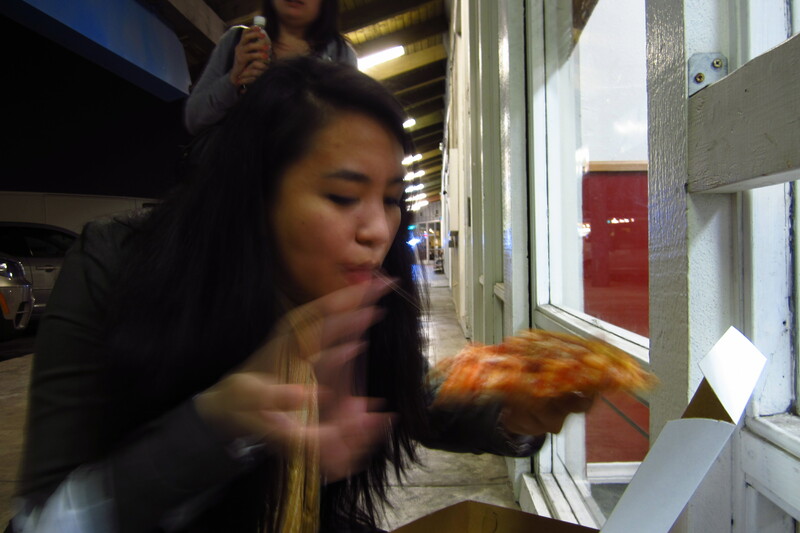 Pizza and kimchee are not a good combination. But Angelo liked it. Just because the ramen wasn’t outstanding, doesn’t mean I would stay away from that place. 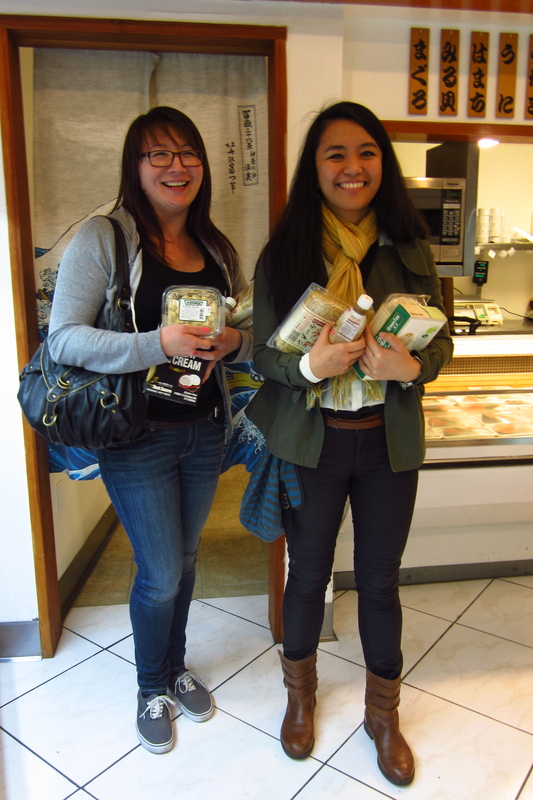 We actually had a great time at the shopping center and maybe Ebisu’s other food items might be good. After hanging out in Fountain Valley, Tanya and I picked up some Sapporo beer and a movie (Safety Not Guaranteed) on the way home. 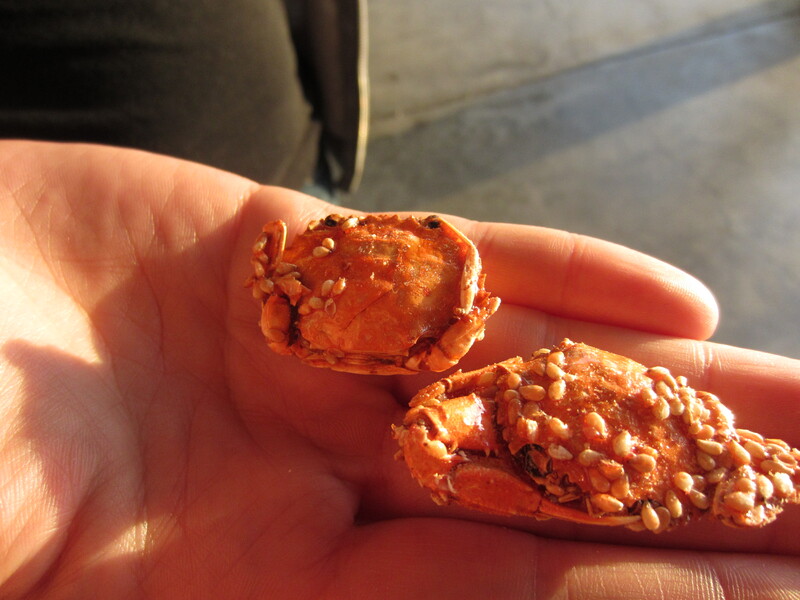 We really wanted to see if the roasted crabs would taste better with beer. Tanya said no, but I was able to tolerate them. I don’t think I would buy those crabs again though! The restaurant is within a shopping center with lots of parking. 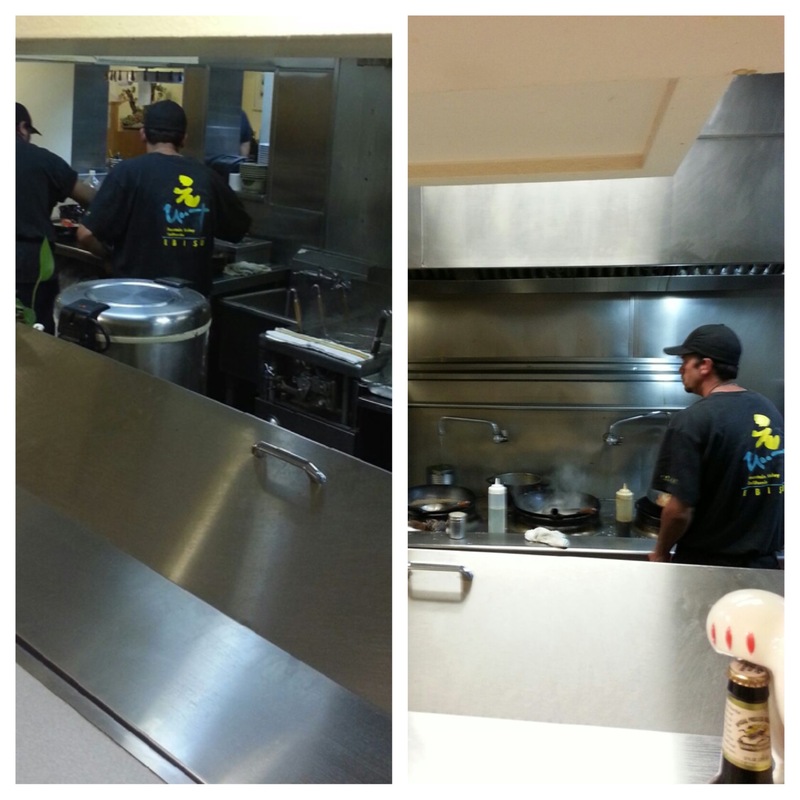 This entry was posted in Food, Foodie, Japanese, Ramen, Ramen Run, Restaurant Review, Uncategorized and tagged Broth, Ebisu, Fountain Valley, Ramen, Restaurant. Bookmark the permalink.